What Are the Benefits of a Tabouli Diet? Tabouli, also spelled tabbouleh or tabouleh, is a popular Middle Eastern salad containing bulgur, tomato, spring onion, mint and parsley. Typically, olive oil and lemon juice are added as a seasoning. Tabouli is extremely popular in several countries of the Middle East, but is also gaining popularity in Western cuisine as a healthy, vegetarian food that is low in fat yet provides fiber, minerals and complex carbohydrates. Most of the ingredients in tabouli are virtually fat free. The bulgur wheat used as the basis of the dish contains no cholesterol and has less than 0.1 percent fat. The herbs, tomato and onion added to the bulgur in tabouli are likewise almost fat free. The olive oil used as a dressing does add a relatively small amount of fat to the dish, but the fat in olive oil is unsaturated. Saturated fat is believed to be the most harmful to your overall health. The bulgur wheat used to make tabouli is made from the whole grains of wheat cereal, with the grains steamed before they are cracked or sliced by a blade. According to the Vegetarian Society website, this means that bulgur can easily be rehydrated by soaking or boiling in liquid. Whole wheats, including bulgur, are a good source of dietary fiber, providing approximately 2.3 grams of fiber in every 100 grams of wheat. The carbohydrates provided in whole wheat are complex carbohydrates, which are believed overall to be more beneficial to health than simple carbohydrates. 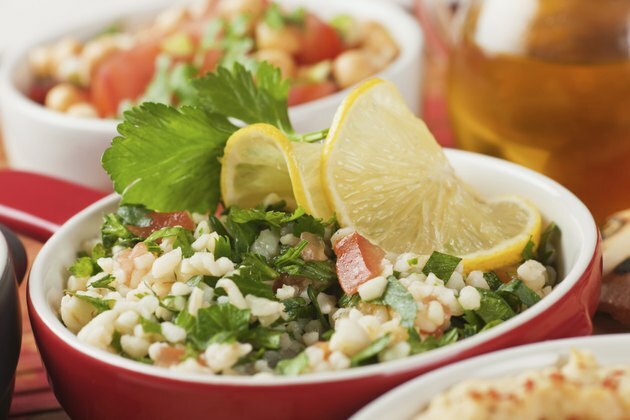 The bulgur used to make tabouli salad is a low-sodium source of several minerals. According to the U.S. Department of Agriculture's national nutrition database, a cup serving of bulgur contains 18 mg of calcium, 1.75 mg of iron, 58 mg of magnesium and 124 mg of potassium. Potassium and magnesium are important for your body's organ, tissue and muscle function, and these minerals also act as electrolytes. Potassium is most commonly found in meat products, so tabouli represents a possible source of dietary potassium for vegetarians. Calcium is essential for your body to grow and maintain healthy teeth and bones. When tabouli is prepared with fresh tomatoes, it is also a good source of vitamin C.